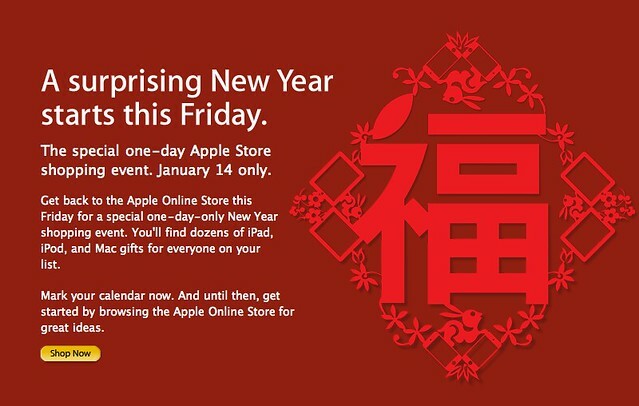 Apple will be holding a one-day Chinese New Year Sale, This Friday, 14th January 2010. If I am not mistaken, they held it once every year, instead of Black Friday in the US, we have a Red Chinese New Year in Singapore. I did not get anything from the 2010 sale. For the 2009 sale, I got the Belkin Auto Charger For iPod And iPhone . Based on my recollection, don’t expect much. Mainly the discounts are for 3rd party accessories only. Looks like this time round they have discounts for Apple products as well!